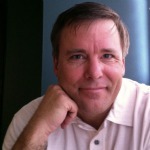 ← Out with Klout. In with Cannoli! I really enjoy every aspect of my work, but there’s one thing that I find positively exhilarating. 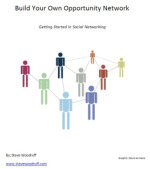 Helping you discover your professional DNA. Yesterday, I had a Brand Therapy session with a consultant launching his business, and it was thrilling to peel back the layers and uncover what was at the core of his skills and professional drives. 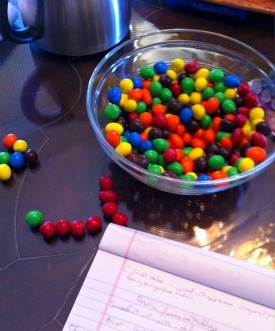 My only props for brand therapy are a notebook, and a bowl of M&Ms. See the red ones there? That’s his DNA. Here’s what happens – after years in business (as a company) or workforce (as an individual), we get encrusted with a mix of roles, expectations, labels, competencies, annual evaluations – and, over time, we lose clarity on who we really are and what our optimal role is. Does your company chase a whole bunch of projects and clients in the pursuit of revenue? Does your business message look like a jumble of bullet points? Exactly. Eventually, we’re a jumbled bowl of M&Ms – the red ones are in there somewhere, but we need an outside analyst to gain clarity. My job, as brand therapist, is to take a day with you and uncover your core offering and drive, your central message, your compelling story, and your go-to-market analogy and strategy. This need is as common for an individual professional re-evaluating career direction as it is for a small company looking to refine its brand. For me, this is more than just a business offering. It’s a mission. I believe that we will re-invent work and realize success by tapping into our core abilities, and creating networks of great people all working at or near their optimal capacity. But first, you have to have the desire – yes, even the courage – to uncover your DNA. And put you at the center of your business direction. Now, if I gave away ALL my secrets, there wouldn’t be much of a business, would there? Actually, it’s not a big secret – it truly is therapy in the sense of asking probing questions, drawing on a well of experience, distilling and synthesizing your thoughts – it’s a very personal and interactive experience. Can’t be automated or even described in a 10-point blog post, because it’s about revealing YOU. I’ve been personally going through a similar process… a re-invention of self so to speak. Sorting through my list of talents and abilities, strengths and weaknesses, etc., and trying to eliminate the labels or expectations of others that get in the way of finding my true self. I’ve discovered that I need to learn to use “all the colors in my box of crayons” and determine which colors are indeed the best use of my true strengths, talents and beliefs. It is only through this process that I will be able to offer and provide others with the maximum value of my services and the only way that I will receive the maximum amount of satisfaction knowing that I’ve given my best to them. Dave – you nailed it. We all (individuals and companies) have a host of things we CAN do – even things that can produce revenue. But the big question is: What do we do best, and therefore what SHOULD we seek to do?